“I need people to be more accountable.” It’s a statement I hear often from leaders as they express frustration with poor performance, mediocre results, silos within their organization, and other ills. If only people would be “more accountable,” then they would step up, take ownership, single-handedly crush their goals, and ride the accountability wave to great success. Wouldn’t it be great if it was that simple? Focus on building trust – Trust breeds personal accountability. If I have trust in my manager, my colleagues, my organization, I am more willing and able to take the lead on projects and be fully responsible for results. Set expectations – In order to be accountable, it helps to understand what you are being held accountable for and what is expected of you and your team. Communicate regularly – Lack of communication is often cited by employees as a real deficit in their organizations. Having lots of meetings gives the illusion of communication. But in reality, necessary communication about key aspects of performance and day-to-day work is not taking place at the level it needs to be in many organizations. Accountability increases when those conversations take place. Model what you want more of – If you want to see more accountability, then be more accountable. To you, accountability may mean meeting (or beating) deadlines, owning up to mistakes, jumping in to help your colleagues, and being proactive. If so, then be certain to demonstrate those behaviors each day and help your team to understand why those actions are important and necessary. Be crystal-clear about what accountable means – A recent post on hbr.org digs deeper into the importance of defining accountability. The authors, Bob Frisch and Cary Greene of the Strategic Offsites Group, outline three types of accountability — issue owner, team coordinator, and tiebreaker — and advise managers to consider first what type of accountability is needed for a given situation. By asking questions such as: Who needs to be involved? Who will have final decision-making power? 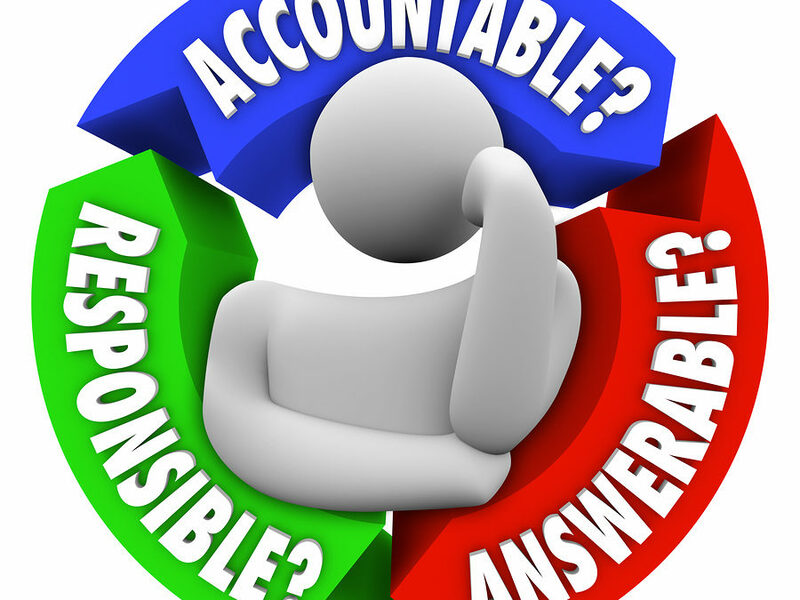 What is the accountable person truly accountable for?, you can get clear on not only who will be accountable but what type of accountability is needed. Taking accountability is a characteristic that we all want in our colleagues, our teams, and ourselves. It is an essential factor for high-performing teams and successful leaders. Doing the right things to foster accountability and reward those who demonstrate the best in personal accountability will reap tremendous rewards. What do you do to foster accountability on your team? For ideas on increasing accountability, contact Robyn at rmcleod@chatsworthconsulting.com.